The faceoff between the striking doctors in Kogi State and its employers has taken a new twist as the government has allegedly procured the services of Youth Corp Doctors. This development according to medical experts spells doom for the State health sector which has been under threat due to prolonged industrial dispute between the government and Doctors in the State. Our Kogi State Correspondent reports that the Medical Doctors under the Kogi State Government have since January embarked on a strike action over percentage payment and other issues regarding their welfare. The Medical Doctors are also insisting on the payment of their four months’ salary balance of 40% owed to them. But rather than harken to their demands, the State Government was accused by the Medical Doctors of procuring the services of Corps Doctors who are allegedly lodged in one of the three Star hotel in the State capital. Furthermore, it was gathered that, as an inducement, the Corps Doctors were allegedly paid N300, 000 as salaries up front for their services and paid daily stipends to augment their feeding and transport cost. A doctor who spoke under the condition of anonymity said “It is unfortunate that we doctors are passing through this inhuman treatment from the government. The so called corps doctors which they claimed to have engaged have no requisite experience to handle critical cases and even work under pressure. "Using them as an alternative to striking Medical Doctors is uncalled for and condemnable. The State Government don't want to bury their ego and come to a round table with doctors on how to resolve the current impasse. For now while the two elephants fight, Kogi People are the ones suffering it, as the State Specialist Hospital is now a ghost of its old self." At the last count, some of the medical doctors from the State are enmass daily moving to other neighbouring state of Nasarawa, Niger, Borno and Zamfara States, where they are welcomed with mouth-watering incentives. All efforts to speak with the Commissioner for Health and it other officials proved difficult. But a source in the ministry described the allegation as an information coming from the pit of hell. However, a source in the Kogi State Chapter Nigeria Medical Association confirmed this development. “NMA could confirm to you that the Kogi State Government has drafted the service of Corp Doctors to treat sick patient in the State. But we don't know the amount of money paid to them by the government. This is rather unfortunate because we never envisage that this will be happening to our health system. Doctors are ready to go back to work provided our demands are met. 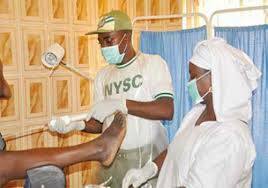 We are doing this for the interest of the State health sector and our future generation” the source stated.